A spectacular, royal rose that is perfect for cutting! Velvet-textured, deep-red blooms with a crown of golden stamens and a strong perfume that will fill the air. One of the very best red garden roses available to gardeners, perfect in the garden or as a cut flower indoors. Repeat flowering through summer and into autumn, so you'll never be short of fragrant, exquisite flowers. 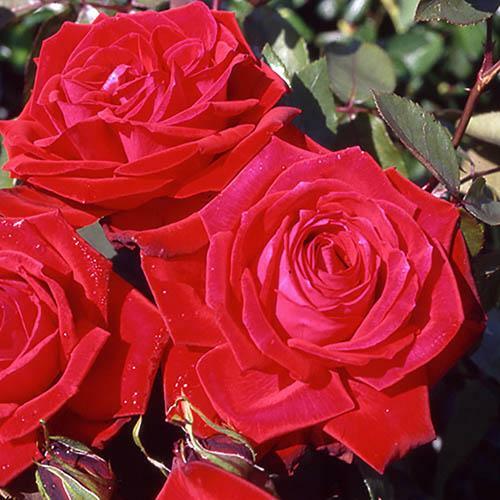 'Royal Prince' has a vigorous habit and good disease resistance, so is the perfect choice if you want an easy to grow rose. Supplied as a British grown, professional quality plant in a 3L pot, ready to plant now. Patio Rose 'Royal Prince' is a wonderfully eye-catching variety with velvety, deep-red blooms each with a ring of prominent golden stamens and a strong perfume that will fill the air, whether in your garden or indoors in cut flower displays. A rose that blooms repeatedly throughout summer and into autumn, you'll never be short of fragrant, exquisite flowers - and they last really well in water so they are great for giving as a posy to someone special! One of the very best red garden roses available to gardeners, 'Royal Prince' has a vigorous habit and good disease resistance, so is the perfect choice if you want an easy to grow rose. Supplied as a British grown, professional quality rose bush in a 3L pot, ready to plant now. To prune, just remove any dead, dying, damaged and diseased stems. Traditionally, you would cut just above a leaf joint with a sloping cut away from the bud, however, this isn't necessary, and don’t worry about pruning too much - roses are very resilient and will grow back.